Work your abs, obliques, and the transverse abdominals to slim down your waist and sculpt a tight, toned tummy. 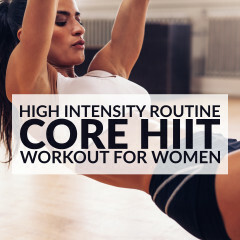 This core and cardio split circuit will help burn off your belly fat for up to 48 hours after the workout is over! Start this core and cardio split workout with a quick warm up routine. 1. Bicycle crunches: 60 seconds. Lie on your back, lift your shoulders off the mat and raise your legs. Bring one knee and the opposing elbow close to each other, and crunch to one side. Return to the starting position and then crunch to the opposite side. 2. Oblique V crunches: 30 seconds + 30 seconds. Lie on your right side with your legs fully extended and your left hand behind your head. Raise both legs and your torso simultaneously, try touching your left knee with your left elbow and squeeze the abs. Return to the starting position, repeat for 30 seconds and then switch sides. 3. Russian twist: 45 seconds. Lie down with your legs bent, and raise your upper body to create a V shape with your thighs. Twist your torso to the right, and then reverse the motion, twisting it to the left. 6. Waist slimmer squat: 30 seconds + 30 seconds. Stand straight with your feet shoulder-width apart and hold a dumbbell with both hands. Rotate your torso to the right, straighten your arms and raise the dumbbell until it’s parallel to the floor. Squat, as you rotate your torso to the left, and bring the dumbbell diagonally across the body until it’s close to your left hip. Repeat for 30 seconds and then switch sides. 7. Skating windmill: 45 seconds. Jump to the right, bend your right knee and bring your left foot behind you. Twist your torso to the right and touch the floor with your left hand. Repeat on the left side and keep alternating sides for 45 seconds. 8. Standing side crunch: 45 seconds. Stand with your knees slightly bent, your feet hip-width apart and place your hands behind your head. Shift your weight to the left leg, crunch to the right side and bring your right knee up toward your elbow. Switch sides and repeat. 9. Plank jacks: 45 seconds. Start in a push-up position with your feet together. Hop your feet as far as you can and land softly on your toes. Hop again to bring the feet together. 10. Lateral step pull: 45 seconds. Start with your feet a little wider than shoulder-width apart and bring both hands above your head. Take a big step back with your left leg, crossing it to the right, bend the front knee and pull your arms back. Return to the starting position and repeat on the opposite side. Finish this split workout with a core stretching routine. 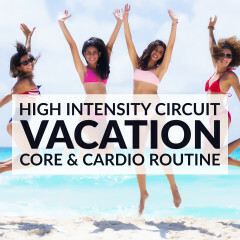 Burn off belly fat for up to 48h after your workout is over with this Core Split Circuit!